Can you hear those yuletide carols being sung by a choir? That’s because it’s the hap-happiest season of all! But before you start mistletoe-ing with hearts a-glowing, you’ve probably got an awful lot of shopping, baking and gingerbread-house making to do. If you want to keep rocking around the Christmas tree without racking up the Christmas debt, you can be more thoughtful in your spending and saving this season. How? We’re glad you asked. Sure, there’s no bow, but we’ve got a gift for you—25 tips on how to save money this Christmas. 1. Develop a gift-giving philosophy. Normally our opening suggestion in every instance of life is to first, budget. And we’ll get there. But, before you budget, you really need to create your Christmas gift-giving philosophy. What does giving mean to you? Is it about finding the perfect present for each special person in your life? Do you scour all the websites, all the stores, and all the sales all year long? Do you give big gifts to few or small gifts to many? Is it about the hunt or the look on their faces when they open the well-thought-out present? Think about your why and who before you start thinking about the how, aka the budget, which reminds us . . .
We don't want a lot for Christmas. There is just one thing we need. Make our wish come true. 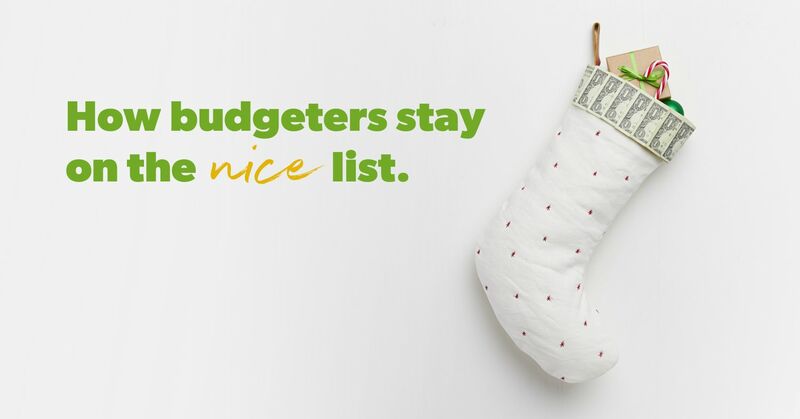 All we want for Christmas, is you—to budget. If you want to stay on Santa’s nice list, set up your planned expenses, and keep to it. Nothing puts the Bah Humbug into Christmas like overspending. Keep yourself safe from the Ghost of Christmas Spending Past this January by tracking your expenses as you go. And—you know what makes that easier, right? EveryDollar Plus (cough, cough . . . shameless plug). It connects to your bank account and streams transactions to your app. Then you just have to drag and drop them into categories! You know what? Upgrading to EveryDollar Plus sounds like the perfect present to give that special someone on your list—you! 4. Choose time over money. There’s an old saying that “it’s the thought that counts,” and for some people, the thought of spending time together exceeds the joy of a physical gift. You can save money this year by being intentional about being together—valuing experiences over accessories, trips over toys, and conversations over clutter. 5. Be a sentimental spender. Be sentimental as you spend. Get presents that line up with the interests or needs of those on your list. This is one of the top ways to insure you’ll see sincere—rather than fake—smiles by the light of the Christmas tree. 6. Rein in other spending. How can you make up for that challenging chunk of change? Well. If you’ve been shopping all year or stashing cash into your sinking fund, you might be set. But, otherwise, you’ll have to find that money somewhere quick. You can side hustle, of course. Or you can just move things around in your budget—spending less on some categories in December to make up for the extra Christmas celebrations. Shop all year. Catch sales and nab that stuffed Sasquatch on clearance you know your bigfoot-enthusiast nephew will cherish. Be mindful of your list throughout the year. This spreads out both the spending and the stress—and maybe even eliminates that last thing, which is a Christmas spirit squasher for sure. As you’re in the spirit of trimming the tree, trim down that Christmas list while you’re at it. Don’t just drop people off the list—at least not the ones who would notice and take offense. (Like Uncle Scott.) But maybe your third cousins could feel your tidings of comfort and joy through a card only this year. And if you want to cut back even more, have a kind chat with your family members. Are you all giving just to give? Is everyone wanting to cut back? A clear conversation about swapping out obligatory giving with a shared meal and stocking stuffers could be just the thing for both your family and your finances. 9. Spend less on trivial traditions. Why do you send Christmas cards to everyone you’ve ever met? Oh, because your mom always did? Why do you purchase the annually released, limited-edition Waterford Crystal ornament, shipped from Ireland? Oh, because your grandmother always did? The real question here is this: Why do we hold onto expensive traditions that don’t mean anything anymore? We aren’t saying to stop making paper chains or going around the table sharing your favorite Christmas memories. Those sound like beautiful traditions. But making a 20-layer, authentic German chocolate cake for Santa? Maybe drop that one. Santa doesn’t need the empty calories. Friends. The National Retail Association expects holiday spending to hit around $720 billion. (2) Yes. Billion. And you know what—there’s no way everybody’s going the cash-only route this year. That’s a lot of spending. And a lot of debt. Don’t let yourself get wrapped up (get it? you’re welcome) in all the sales and spending shenanigans. You may think these retailers are in it to help you, but their real goal is to get in on a part of that $720 billion holiday magic. Stick with your budget, and shop wisely. 11. Use old gift cards. Think about both the money left on old gift cards, as well as the cards you’ll never use because they’re to places you never shop, eat or visit. Consider the partial cards as discounts and use them to buy presents. Regift (not a dirty word, as we’ll explain later) the others to people who’ll better appreciate them. Or sell cards online at Cardpool or Raise. Don’t let those little pieces of plastic go to waste this Christmas! Ordering online means shopping around from the convenience of your very own couch as you roast chestnuts on an open fire. That’s the kind of multitasking we’re all about. Cross-check the price on that walks-and-talks doll across multiple stores without ever putting on real pants. However, make sure you do this early enough to get the cheapest online shipping options. The last thing you need is a budget ruined by all those overnight shipping fees. Speaking of shipping, plenty of stores offer it free of charge—if you spend a minimum amount. So, do that! If you see the perfect superhero-themed sweatshirt you know your kid-at-heart dad would love, but you’re below the aforementioned minimum amount, keep looking around. Is there anything for your bro or admin assistant on that same website? Don’t buy just to buy, but be thoughtful and combine orders to keep those shipping fees at bay. It’s almost that time again—time to get more stuff. So, in preparation, why don’t you get rid of some of your old stuff? Not only will you make room for the new, you’ll also make some money to buy other people stuff. 15. Get thrifty with stocking stuffers. The stockings are hung from the chimney with care in hopes that you’ll fill them, so they don’t stay bare. Yikes. That would be a Christmas catastrophe. But it’s one you can avoid without spending all your holiday budget on things you’ll jam into an oversized sock. When that Halloween candy goes on sale, stock up so you can stuff the stockings with it! As for all the other things in the stocking, don’t feel pressured to fill them just for the sake of it. Think thrifty and necessary: an avocado slicer for your guac-loving spouse, a selfie-light ring for your screenager, and a grow-a-sunflower-in-a-bag kit for your nature-enthusiast kid. These are all real things, and plenty other real items are well priced and take up a goodly amount of stocking space, so you can save all the good candy for yourself. Your last move is to hit up the dollar store for gel pens, coloring books, and those character-covered washcloths that are folded up into a tiny circle until you just add water. Ho-ho-hold the excess spending and give the people what they (affordably) want. If you want to give something personal, memorable and one of a kind, make it. Seriously. Pinterest has a wealth of ideas and instructions. If you aren’t super crafty, you can bake up a Christmas (snow?) storm, put together a gift basket of someone’s favorite things, or whip up some body balms and butters. Nothing says “Happy Christmas” like homemade. What can you get for the hardest-to-buy-for people on your list? Nothing. Instead, give money in their honor to their favorite charity. Create a card or get one from the company, explaining the donation. If it feels a little off not giving something, find a charity who specializes in selling fair trade goods that give jobs to those in need. That way, everyone is blessed. Instead of buying things, consider going places this year. Buy tickets to a show, musical, play, game or activity. You can add in a gift card to their favorite restaurant, and you’ve paid for the full fun package. Not only do you get to enjoy the excitement together as the present is opened, you know you’ve got the event itself coming up on the horizon. When it comes to gift giving, it’s the best time to get personal. We aren’t saying you should go into TMI territory. We mean making sure the presents you purchase are thoughtfully directed to the recipient. If it’s the “thought that counts,” then count on doing some thinking. You probably know not to buy a cheese-of-the-month club membership for your lactose intolerant friends. But go beyond just avoiding what they can’t have or don’t like. If you shop all year, you won’t get down to the last minutes before gift exchange time and throw any and everything you can find in your shopping cart. A cute—but random—gift is just clutter. However, a llama notepad you see in March for your alpaca-loving cubicle mate is a personalized present. Don’t be accidental this Christmas. Be intentional. 20. Live by the list. There’s a reason Santa checked his list twice, and it’s not just because he’s absentminded. When we go off the list, we overspend. Now, if you realize you forgot a friend—of course you add them in! But when you’ve got your philosophy and budget set, don’t get swept up in the Christmas spirit and start buying every snowflake-themed item you find for every person you’ve ever met. 21. Say no to random gift exchanges. Put an end to the white elephant or junk-for-junk gift exchanges at your work, book club, and antique kite-flying society. Christmas is expensive enough without these meaningless social pressures. Be kind, but just say no. If there’s anything the 80s teen flicks taught us, it’s that you never find love with the first guy who asks you to prom. In light of that life lesson, we probably shouldn’t buy the first princess-unicorn sleeping bag we see. Not these days, anyway—where options are at your very fingertips. Shop around to find the best deal. Just be sure to keep your eye on shipping costs and delivery dates. Regifting has a bad reputation, but it’s time to move away from that. Maybe we should name the act “relocating a present to its more appropriate and rightful owner.” It isn’t catchy—we’ll work on the title while you work on the concept. It’s okay to regift! But there are ground rules. You don’t want to hand Uncle Scott the same teacup night-light he gave you last year. You don’t even want to give him the cat-covered music box that plays R.E.O. Speedwagon and says Can’t Fight This Feline Any Longer—no matter his love of classic American rock—if it was something a mutual friend gave you. However, the brand-new crockpot your well-meaning in-laws gave you when you already have two could easily be regifted to your newlywed cousins on the opposite side of the family. Be tactful, but there’s nothing wrong with this kind of gift relocation program. It saves money and keeps a gift from going unused. 24. Don’t shop at the mall. Avoiding the mall means also avoiding every single pushy kiosk salesman. Plus, you won’t have to worry about the millions of distractions, including (but not limited to) creepy mall Santa, the wafting aroma of cinnamon-sugar pretzels, and all those tempting retail window displays. Oh, and the parking lot jams. Oh, and the gobs of people. Save money, stress and time—don’t go to the mall. You don’t have to spend half of your December income on colorful or character-covered paper that’s going to end up in torn-to-shreds piles around your floor Christmas morning. Get creative! Pick up some reusable bags at the dollar store, and you’ll be giving a gift inside a gift. Is that like gifting inception? Or—what’s black and white and red all over? Your presents wrapped in newspaper with red twine. That’s eco-friendly, wallet-friendly and festive. Now back to where we started—the very best thing you can do to save money this Christmas is to budget. When you make and keep to your spending plan, you’re setting yourself up for financial success all year long. Open up EveryDollar and start budgeting the good tidings for you and your kin. Good tidings for Christmas, and a debt-free new year. Create your free budget with EveryDollar! Sign up today.